Hummingbirds have extremely fast metabolisms that they fuel with the sweet nectar found in flowers. Due to their small size and rapid movements, hummingbirds must eat almost constantly. Hummingbird feeders can be a great way to attract hummingbirds to a lawn or garden, and will help to supply them with a regular source of food. For those who dislike the idea of feeding hummingbirds premade, red dye-filled food mixtures, homemade hummingbird food made with organic sugar is a great alternative. Fill a saucepan with 4 cups of water and bring to a boil over high heat. Pour 1 cup of organic cane sugar slowly into the boiling water. Stir until the sugar has completely dissolved and the mixture appears clear. 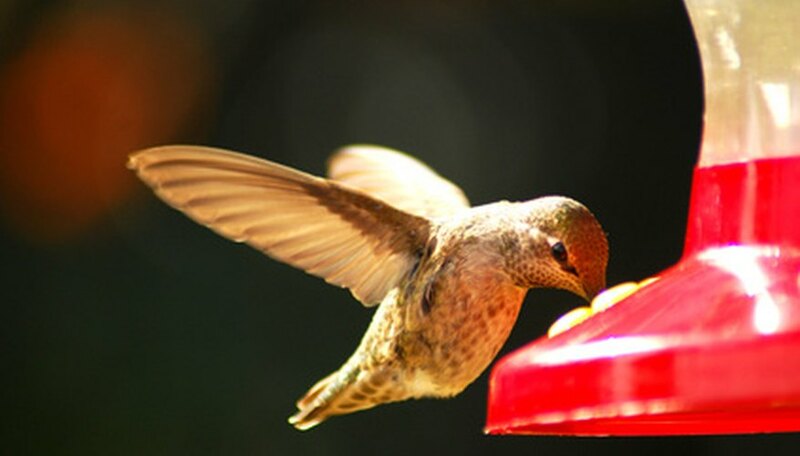 Remove the hummingbird food from the heat and allow to cool completely before pouring it into your hummingbird feeder. Store any excess organic hummingbird food in the refrigerator for up to one week. Do not add red food coloring to your hummingbird food. Rinse the feeder with hot water each time you change the food, which should be every two to three days, to prevent the buildup of mold and fermentation. Clean the feeder each month by soaking in a solution of 1/4 cup bleach to 1 gallon of water for an hour and then rinsing well.